We’re not Pigging, this year’s Wild Boar Week is Crackling! As well as a fully stocked menu of boar and game treats in 31 restaurants, this year’s Wild Boar Week has a fantastic line up of 18 live music events! The Angelo Tristan Band mark the start of Wild Boar Week at the Ypres Castle Inn this evening (Friday). Over the weekend there’s Jazz at the Grapevine and more live music at the Ypres Castle Inn on Sunday with Sound Beach at 4pm. On Saturday 21st The Gallivant in Camber have a delicious “Forager’s Autumn Feast” from 7pm, booking is essential! Olde Worlde Wines will be a hot spot for food and entertainment with Kyle Tatner serving up Wild Boar Gumbo with Smoked Sausage and Smoked Prawn and Aromatic Sticky Wild Boar Belly Ribs from midday on Saturday followed by an “Afternoon of Poetry, Music and Miscellany” from 4pm on the Sunday. On Tuesday 24th October the Rye Ukulele Experiment are performing at The Queen’s Head Inn and Wednesday has Phil Law and Friends at The Standard Inn. With a Jazz Supper at The Mermaid Inn, Sam Calver at the Globe Inn Marsh and an Open Mic Night at The Queen’s Head Inn, Thursday has a superb line up. The Four Chords are playing at The Queen’s Head Inn on Friday 27th and on Saturday, after Kyle Tatner has served more Wild Boar at Olde Worlde Wines, the Rockitmen have their Halloween Party at Rye Community Centre. Wild Boars are to be found in over 100 shop windows around Rye this weekend for Wild Boar Week. 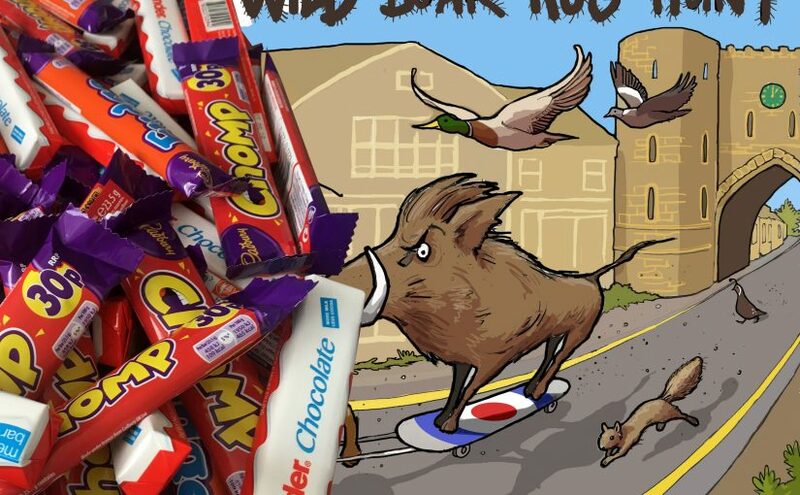 This half term, eagle-eyed children will be scanning the town for the names of 20 boars to exchange for a Cadburys Chomp, Fudge or Kinder bar at the toy department upstairs in Adams of Rye. Forms can be downloaded from wildboar.org.uk or collected from Adams of Rye.